My translation of this jargon is: A plug in is a mini program whose code is already written for you that enhances the operation of your Web site or blog and/or allows you some degree of customization. WordPress (.org only, not .com) generally comes with two standard plugins. These are Akismet, a spam filter now fee based, and Hello Dolly, an original application which is rather useless and should be deleted. You can search for plugins in the pull down section of your dashboard, get information, visit the author’s site and even see applications or get instructions. You can install plugins from the same area or screen once you determine what plugins are suitable for your site. Some plugins not listed in WordPress need to be manually downloaded and installed. Caution: Use only plugins from reputable sources such as those listed under WordPress.org. If you are like me and not a coder, neither of us can tell if there is malicious code within the plugin’s code! Beware of charlatans and snake oil salespeople. Also check regularly for updates. A plugin that is not current may allow hackers into your site via a back door. They should be eliminated. 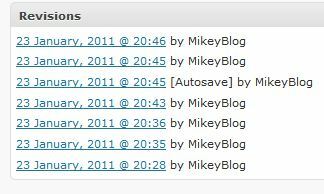 (Jan. 26, 2011) When you edit a post or a page in WordPress, the program automatically creates a backup file in your database. Therefore every time you add a revision you increase the size of the database. Multiple revisions add multiple saves and the older data keeps accumulating. This plugin removes and deletes old revision of posts, pages and related meta content completely. I have been using this plugin without incident for years. This plugin is listed on the wordpress.org site and you can learn more about it Better Delete Revision. This plugin has not be updated over some time and may cause issues. I do continue to use it and install on other sites. Proceed with caution. Need help with your plugins? Contact your DIY WordPress Tutor or call 847-634-6535, now!